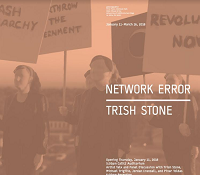 The Winter 2018 exhibition in the Qualcomm Institute's gallery@calit2, NETWORK ERROR, features a recent work by new media artist and gallery@calit2 principal investigator Trish Stone. A network error occurs when there is a software malfunction or replication of a virus. For her exhibition, NETWORK ERROR, the artist confronts the social, cultural and institutional network vis-à-vis the virality of her body. By replicating her own body in miniature, Stone iteratively infects/assaults the allegory of the network, calling for revolution as a cure. 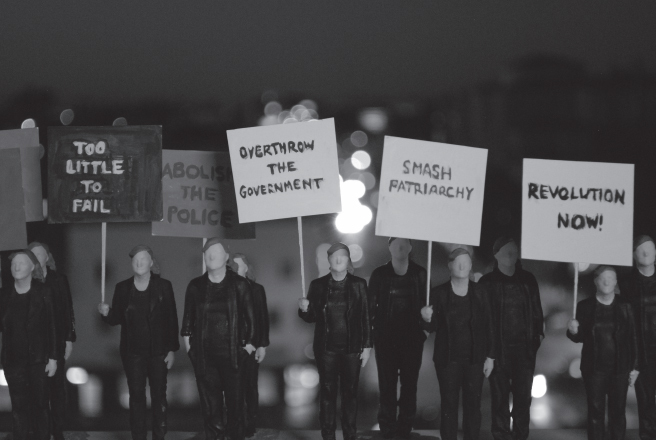 For the exhibition, Trish Stone has created a squad of 3D-printed 'sel­fies' and uses them to stage tiny protests in public spaces, presenting the documentation as research in the field. Works include a series of photographs, an interactive video game, and a live stream of the ­figurines installed in the gallery@calit2’s interior and hallways. Visitors are asked to question the scale of their political fear in contrast to their physical space. How big is your fear? How big are you? The artwork deals with issues of identity and collaboration, how the body is represented and replicated, and the artist explores the relationship between performance and protest. Security and insecurity become the personal and political poles of the landscape, concerned with state patrols while planning for revolution. Trish Stone gratefully acknowledges the Qualcomm Institute (QI) and the University of California Office of the President (UCOP) for their continued support of the gallery@calit2. The artist also extends special thanks to Visual Arts Professor Michael Trigilio for production and sound design, as well as engineers Frank Cardone and Justin Burger for 3D printing in QI’s Prototyping Facility. Trish Stone is a new media artist whose conceptual art projects deal with issues of surveillance and intimacy. Her project Things I Never Say, in which she used publicly-accessible webcams in San Diego as a platform for performance, was exhibited in 2011 at Art Produce Gallery, along with an Outdoor Video Screening of videos curated along the theme of public space. Selected exhibition venues of Stone’s work have included the Oceanside Museum of Art, Angels Gate Cultural Center in Los Angeles, Works San Jose, California Museum of Photography at UC Riverside, 21Grand in Oakland, and Southern Exposure in San Francisco, CA. Stone holds an MFA (2003) from the California College of Arts and Crafts. Stone continues her interactive, interruptive, interventionist art practice in San Diego, where she serves as ARQiVE Curator, gallery@calit2 Principal Investigator, and Composer in Residence Production Coordinator for Qualcomm Institute, Calit2, UC San Diego. Stone teaches Media and ICAM classes in the Visual Arts Department as a Lecturer at UC San Diego. Michael Trigilio is a multimedia artist living in San Diego and an Associate Teaching Professor in the Department of Visual Arts at UC San Diego, where he teaches courses in Media Arts and Sound. Born and raised in San Antonio, Texas, he received his B.A. in Humanities from the University of Texas at San Antonio. His fear of religion notwithstanding, he was ordained as a lay Buddhist priest in 1997, a role from which he resigned five years later. Trigilio received his MFA from Mills College in 2003. His work is inspired by material that balances sarcasm and prayer, giving rise to works that examine religion, humor, narcissism, and demystification. His film, Bodhisattva, Superstar (2010), was included in the HERE NOT THERE exhibition at the Museum of Contemporary Art San Diego. In December 2010, Trigilio joined Katie Faulkner, artistic director the Little Seismic Dance in San Francisco in a residency at the Maggie Allesse National Center for Choreography. Together they created the ambitious, large-scale dance-media work, We Don't Belong Here, as a commission for Dancers' Group in Union Square (San Francisco) in Fall 2011. Trigilio is a founding member of the independent radio project, Neighborhood Public Radio, which was included in the 2008 Whitney Biennial exhibition. This work in public-practice / public-culture / public-sonification was hosted in a three-month residency at the Museum of Contemporary Art (MOCA) in Los Angeles in Spring 2011. His work in video, sound, and radio has been presented in many venues nationally and internationally, notably the Anthology Film Archives in New York, Southern Exposure in San Francisco, the Museum of Modern and Contemporary Art in Strasbourg, the Contemporary Museum in Baltimore, and a commission for a soundwork at the Los Angeles County Museum of Art (LACMA). Other recent projects include Project Planetaria, a UCSD Center for Humanities research group (with astrophysicist Adam Burgasser and artist Tara Knight), focusing on interpreting stellar data through performance, sound, and media-work. Pinar Yoldas is an Assistant Professor in the Department of Visual Arts effective in Winter 2018. She is a Turkish cross-disciplinary artist/researcher whose work, "An Ecosystem of Excess", was the Winter 2017 exhibition in the gallery@calit2. Her work develops within biological sciences through architectural installations, kinetic sculpture, sound, video and drawing with a focus on anthropocene and feminist technoscience. Her solo shows include "The Warm, the Cool and the Cat", Roda Sten Konstall (Sweden) and "An Ecosystem of Excess", Ernst Schering Project Space, Berlin (2014). Her group shows include ThingWorld, NAMOC National Art Museum of Beijing (2014); Transmediale Festival, Berlin (2014); Polytech Museum, Moscow (2015), ExoEvolution at ZKM (2015), the 14th Istanbul Biennial (2015) and Taiwan National Museum of Fine Arts (2016). Yoldas has been an invited speaker at Haus der Kulturen der Welt, Northwestern University, Angewandte Kunst, University of Michigan, Columbia University, University of Arizona, Reed College, University of Buffalo, Penn State and UCLAm among many institutions. She was a 2015 John Simon Guggenheim Fellow in the Fine Arts and a 2016 Future Emerging Arts and Technologies (FEAT) Award recipient. She holds a bronze medal in organic chemistry in Turkey's national science olympics and had her first solo painting exhibition at age five. Jordan Crandall (moderator) is a media artist, theorist and performer. He is Professor in the Visual Arts Department at UC San Diego. He is the 2011 winner of the Vilém Flusser Theory Award for outstanding theory and research-based digital arts practice, given by the Transmediale in Berlin in collaboration with the Vilém Flusser Archive of the University of Arts, Berlin. His current project, UNMANNED, is a blend of performance art, political theater, philosophical speculation, and intimate reverie. It explores new ontologies of distributed systems, and the status of the human in a militarized landscape increasingly dependent on automated technology. Crandall is a founding director of the Active Structures and Materials research studio at UCSD, sponsored by Department of Visual Arts and the Center for the Humanities. He is also founding editor of the online journal VERSION.